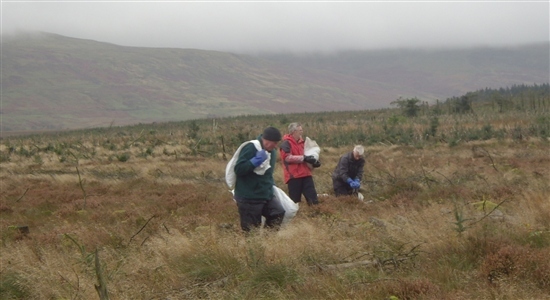 The RSPB Dove Stone team made their annual raid on Denton Fell to harvest sphagnum for their peatland restoration project. Geltsdale volunteers turned out to help bag up a trailer load of moss to start a new life in Derbyshire. After a hot summer, the peat bog has stayed wet and cranberry has abounded. In a reciprocal arrangement, the Dove Stone wardens helped lug 1000 tree stakes up the fell to help with a guarding experiment running in the Bruthwaite plantation. Thanks to all those who got involved.